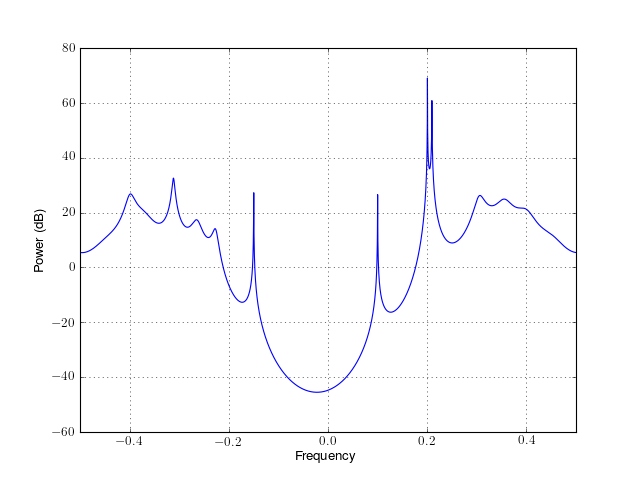 The white noise input variance estimate is also returned. Because the method characterizes the input data using an all-pole model, the correct choice of the model order p is important. the AR parameters are the same as those returned by a completely different function arcovar_marple(). This implementation is based on [Marple]. This code is far more complicated and slower than arcovar() function, which is now the official version. See arcovar() for a detailed description of Covariance method. This function should be used in place of arcovar only if order<=4, for which arcovar() does not work. Fast algorithm for the solution of the covariance least squares normal equations from Marple. this code and the original code in Marple diverge for ip>10. it seems that this is related to single precision used with complex type in fortran whereas numpy uses double precision for complex type. the AR parameters are the same as those returned by a completely different function arcovar(). For a detailled description of the parameters, see arcovar(). 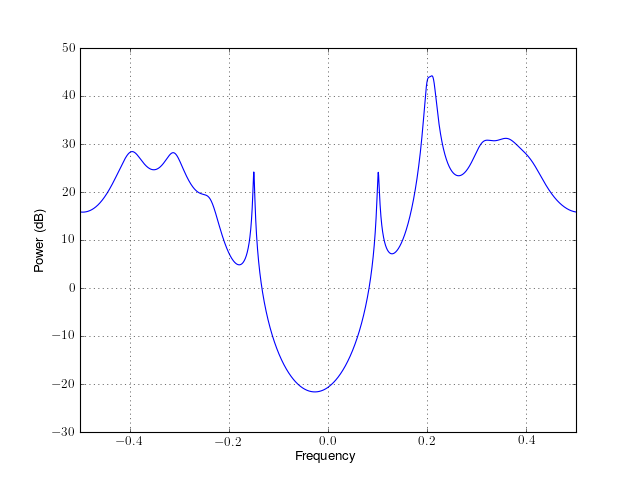 This function computes either the Music or EigenValue (EV) noise subspace frequency estimator. The separation of the noise and signal subspaces requires expertise of the signal. However, AIC and MDL criteria may be used to automatically perform this task. You still need to provide the parameter P to indicate the maximum number of eigen values to be computed. 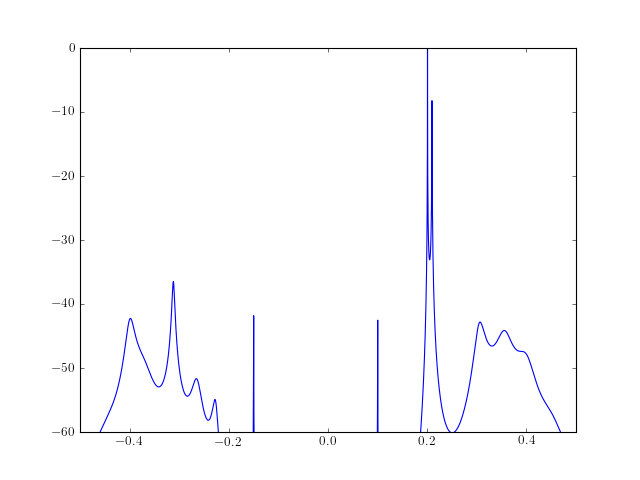 The criteria will just select a subset to estimate the pseudo spectrum (see aic_eigen() and mdl_eigen() for details. pseudo spectrum. func: eigen does not compute a PSD estimate. Indeed, the method does not preserve the measured process power. P (int) – maximum number of eigen values to compute. NSIG (if specified) must therefore be less than P.
method (str) – ‘music’ or ‘ev’. 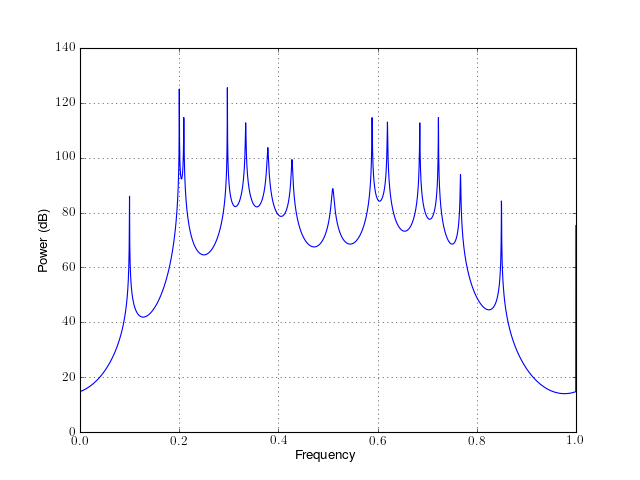 NSIG (int) – If specified, the signal sub space uses NSIG eigen values. 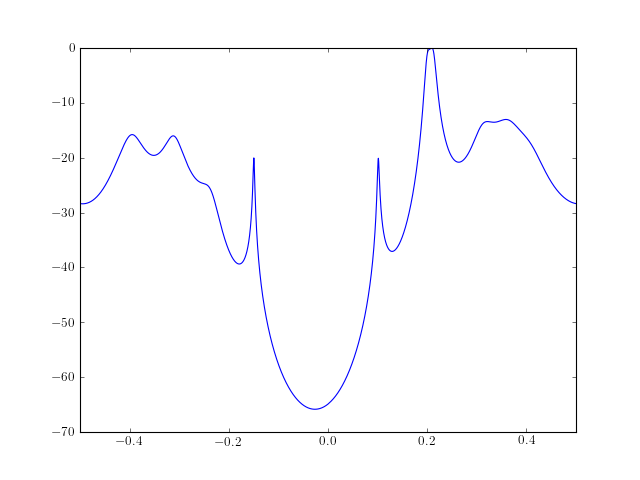 threshold (float) – If specified, the signal sub space is made of the eigen values larger than , where is the minimum eigen values. what should be the second argument of the criteria N, N-P, P...? Class to create PSD using ARMA estimator. For a detailed description of the parameters, see arma_estimate(). See pmusic() and eigenfre() for description. where is the inverse of the estimated autocorrelation matrix (Toeplitz) and is the complex sinusoid vector. The MV spectral estimator is not a true PSD function because the area under the MV estimate does not represent the total power in the measured process. MV minimises the variance of the output of a narrowband filter and adpats itself to the spectral content of the input data at each frequency. The following example computes a PSD estimate using minvar() The output PSD is transformed to a centerdc PSD and plotted. pminvar, a Class dedicated to MV method. For a detailled description of the parameters, see minvar(). the AR parameters are the same as those returned by a completely different function modcovar_marple(). 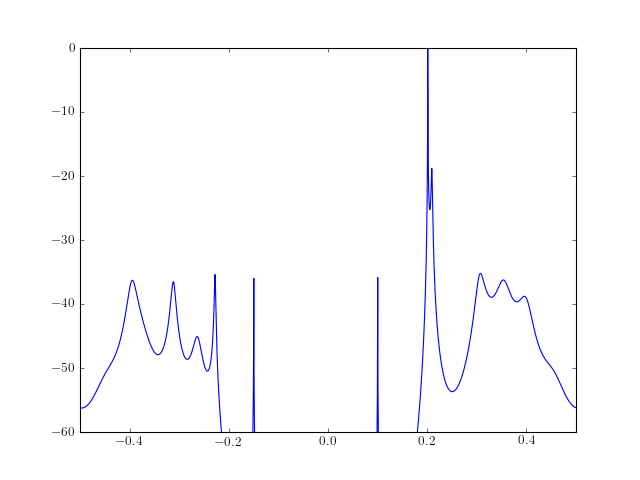 Fast algorithm for the solution of the modified covariance least squares normal equations. This implementation is based on [Marple]. This code is far more complicated and slower than modcovar() function, which is now the official version. 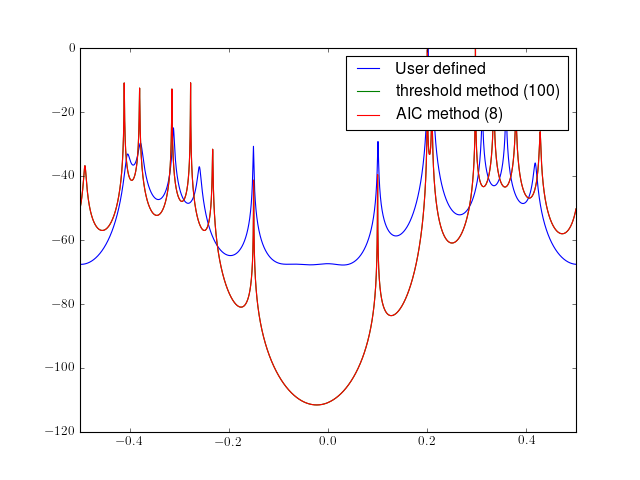 See modcovar() for a detailed description of Modified Covariance method. the AR parameters are the same as those returned by a completely different function modcovar(). validation. results similar to test example in Marple but starts to differ for ip~8. with ratio of 0.975 for ip=15 probably due to precision. For a detailled description of the parameters, see modcovar().